Minntech Filtration Technology Group, of Minneapolis, announces unique cartridge filters for the pharmaceutical water market. 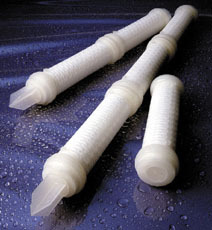 The FiberFlo® 50 cartridge filters use the company’s polysulfone hollow fiber membrane technology. They are designed to remove both bacteria and endotoxins—the remnants of bacteria destroyed by heat, chemical disinfection or mechanical action. Water used in the creation of pharmaceutical products should be free of both bacteria and endotoxin contamination.